Register Now for ISKCON Disciples Course - August 1 - August 4 ~ The Toronto Hare Krishna Temple! Please mark your dates for the second ISKCON Disciples Course in Toronto from Saturday, August 1st - Tuesday, August 4th. 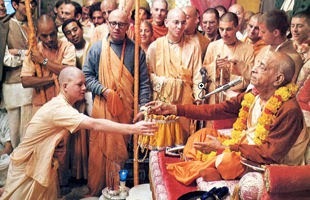 This course has been developed by the GBC (Governing Body Commission) and shall be a mandatory pre-requisite for all devotees accepting first OR second initiation by an ISKCON guru, effective Janmastami 2015. We encourage all devotees to try their best to attend and also request your help in spreading the word for the course. The course will be facilitated by HG Laxmimoni devi dasi, who is a senior disciple of Srila Prabhupada. She has been involved in ISKCON educational projects since 1974. Now, she is a member of the GBC Ministry of Educational Development and a GBC Deputy. We kindly ask anyone who is interested in attending to please fill out a preliminary registration form by clicking here.